I had the thought of playing up that angle, so I used a bright blue cord and gold beads as well as a seed bead mixture called, coincidentally enough, Egyptian Lapis Stripe. I'm not sure I was able to capture the feel I was after, but I really do like this color! 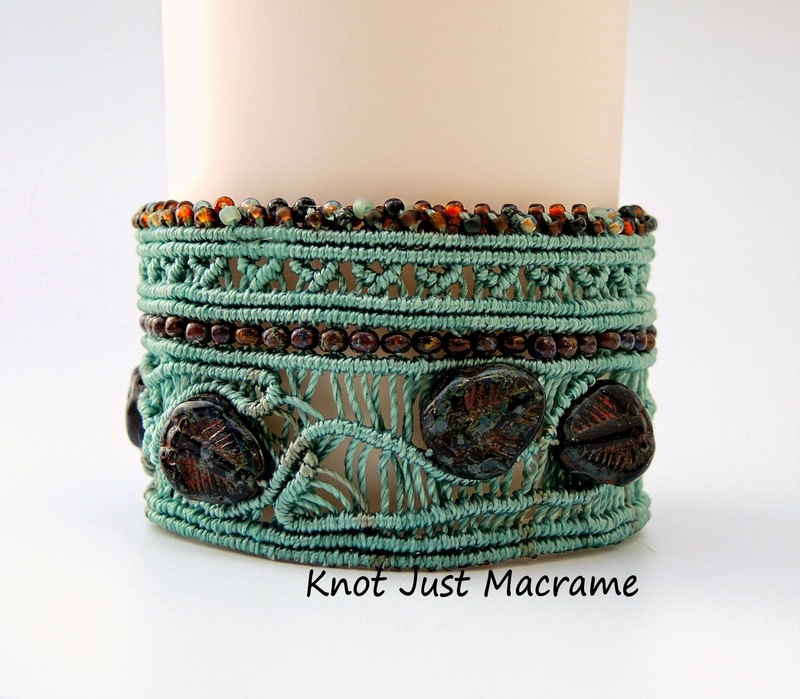 An online class for this micro macrame bracelet is available at CraftArtEdu.com and at a special introductory price for a couple more days - through Sunday. I can't wait to see what color combinations you come up with! I'm on a roll, folks - two micro macrame classes in two months! Like the last class I did, the Leafy Cuff, the Argus Cuff bracelet is worked across the piece rather than down it. This means lots more cords to work with, but also leads to the possibility of lots of different designs. I had fun figuring out how to make the eye pattern on this one, and the name springs from that (thanks, Marge!!) Argus Panoptes in Greek mythology is the monster with 100 eyes. Doesn't that seem very appropriate for this bracelet? The nice folks at CraftArtEdu.com are celebrating the release of this new class with a special deal for you. The new Argus Cuff, the Leafy Cuff, and all of my other micro macrame jewelry classes are on sale at 25% off their regular prices through Sunday, February 22, 2015 (details here). If you're an adventurous do-it-yourself type and you want to learn to make beaded macrame jewelry, this is a deal you don't want to miss. My classes are very detailed with lots of close up photos and instructions. I also include hints and tips and most of them (including this one) have video as well. All at your fingertips and available on your schedule at your convenience. I'm a big fan of CraftArtEdu.com - I wouldn't be working with them if I weren't. Once you purchase a class there, it's yours forever. You can watch it as many times as you need and then refer back to it next year if you've forgotten how to do something. They stand behind their classes, too, and if you have a question, they will find you an answer. 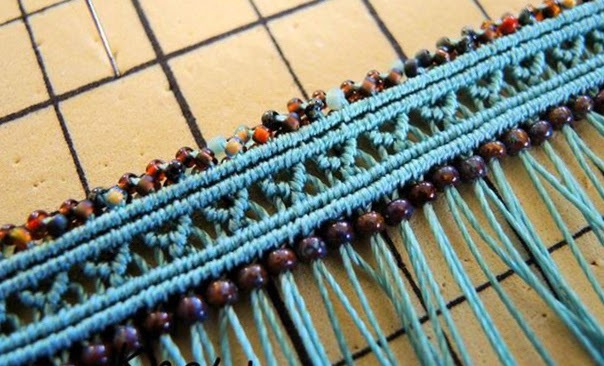 Are you learning micro macrame yet? What are you waiting for? I have too much micro macrame jewelry on hand. I have 50 bracelets listed in my shop, and nearly 20 pair of earrings and 20 necklaces. It makes me sad to see my pretty little babies all dressed up and ready to go, just sitting here in a pile waiting for their forever homes. They need a chance shine! 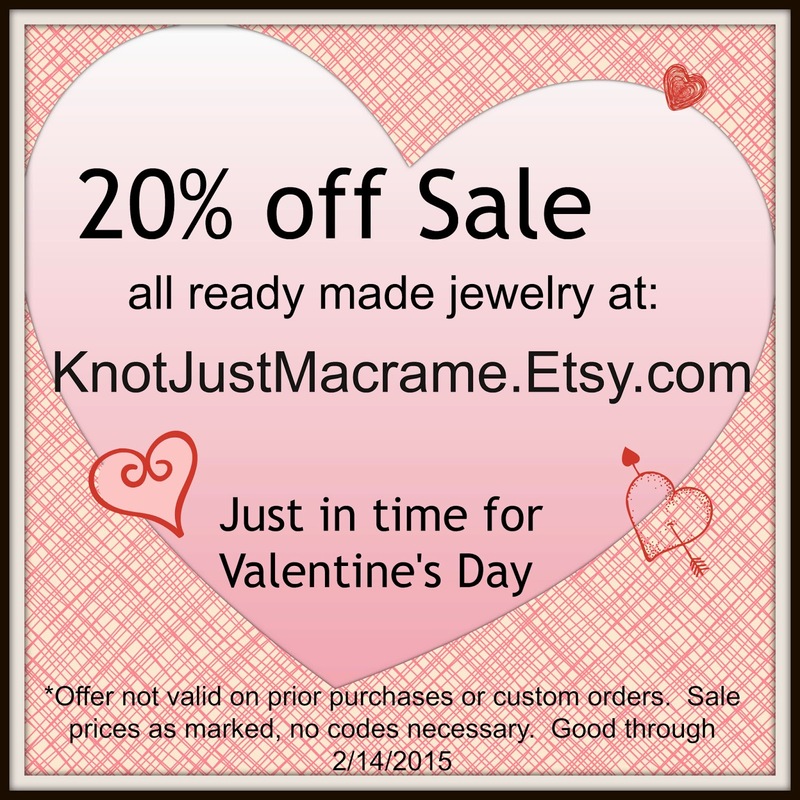 So, just in time for Valentine's Day, I'm having a 20% off sale on all my finished jewelry. Want a little peek? The sale runs through Valentine's Day (February 14, 2015). Happy shopping! Red is my grandmother's favorite color and I just don't get it. Aside from being the color of some wonderful fruits and vegetables, I can't see that it really has anything going for it. Yes, I will always pick the red Kool Aid and eat the red fruit snacks first, but when it comes to jewelry, the red one is going to be one of my last choices. The micro macrame cuff at the top of this post is the first I made from my new stash. I used the Poinsettia cord and matte frosted beads. The beads got a little lost in the sea of red, but if you look closely, they have some nice color variation to them, including bits of orange. A decent enough start for an anti-red person like myself, but with Valentine's Day looming, I really thought I could do better. I've started on a new cuff and I really like how it's coming along. Not only is it knotted in red cord, but the beads have pink and orange in them. I'm embracing the warm colors. Giving them a big ol' smooch right on the lips. I am also playing with a new design with some fun curves. Oh, yeah! I can finally show you the project I made for the Back in Time Blog Hop sponsored by yours truly and The Fabulous Linsday Starr of Phantasm Creations! I've had loads of fun playing with different ideas for a project and just generally nerding around with beads, cord and dinosaur bits. How could you not like these skulls - a t-rex and diplodocus - from Artito on Etsy. In fact, you might want to take a second right now and hop over to that shop and read some of Tracey's item descriptions. I probably spent an hour or so laughing at the write ups. I had plans to hang a skull from a necklace, but I spent so much time playing around in my stash and surfing for the most perfect, different and interesting component piece that I ended up not having the time to do it. I did, however, come up with a great bracelet - without skulls. Ta da!!! Trilobites in a Cambrian Sea rendered in micro macrame knots and accented with glass beads. Since I've been experimenting with cuff designs lately, it just seemed fitting to do one with a prehistoric theme. I added some randomly free form knotting around the trilobites themselves like flowing water, since trilobites were marine organisms. The clasp on this is a tube bar clasp from Beadiful Gifts; it frames the design perfectly.